By visiting a Pass the OT website or providing personal information to us, you are consenting to the collection, use and disclosure of your personal information as described in this Policy. If you do not consent to the collection, use and disclosure of your personal information as described in this Policy (and any applicable Country or Web Site Privacy Statements), do not use Pass the OT Internet Sites, contact Pass the OT, or Submit Data to jshane@passtheot.com via Internet form. In short: We collect personal information that you provide to us such as name, address, contact information, school attended, study preps used, previous NBCOT® exam test scores, passing NBCOT® test scores, NBCOT® exam history, your program director contact information, personal details, company, and payment information. Pass the OT collects the information you knowingly and voluntarily provide when you use a Pass the OT Internet Site, for example, the information you provide when you sign up to receive email alerts, when you complete a survey, or when you ask us a question or email us with feedback. In many cases, this information will be personal information. Pass the OT uses this information for the purposes for which you provide it. We may also use the information we collect on Pass the OT Internet Sites for various business purposes such as customer service, fraud prevention, market research, improving our products and services, and providing you and your company with information and offers we believe may be of interest to you. We may also remove all the personally identifiable information and use the rest for historical, statistical or scientific purposes. Pass the OT will never sell personal information collected from its Internet sites to mailing list brokers or other third parties. Pass the OT may share your personal information with third parties we hire to perform services for us. These third parties are required to use the personal information we share with them only to perform services on our behalf and to treat your personal information as strictly confidential. In some cases, Pass the OT may share your personal information with third parties who partner with us to provide products and services to our customers. When we do so, we will require our business partners to use the personal information we share with them in a manner consistent with the purposes for which it was originally collected (or to which you subsequently consented) and only as permitted under this Policy, any applicable Country or Web Site Privacy Statements, and all applicable privacy and data protection laws. In certain, limited circumstances we may share or transfer personal information to unrelated third parties. in connection with the sale, purchase, merger, reorganization, liquidation or dissolution of Pass the OT or a Pass the OT business unit. Pass the OT may obtain information about you by installing a “tag” on your computer’s hard drive. This tag is known as a “cookie.” All Pass the OT Internet Sites use “session cookies.” A session cookie is used to tag your computer with a computer-generated, unique identifier when you access our site. A session cookie does not identify you personally and expires after you close your browser. We use session cookies to collect statistical information about the ways visitors use our sites’, which pages they visit, which links they use, and how long they stay on each page. We analyze this information in statistical form to better understand our visitor’s interests and needs to improve the content and functionality of our sites. Some Pass the OT Internet sites also use “persistent cookies.” These cookies do not expire when you close your browser; they stay on your computer until you delete them. By assigning your computer a unique identifier, we are able to create a database of your previous choices and preferences, and in situations where these choices or preferences need to be collected again, they can be provided by us automatically, saving you time and effort. If you do not wish to receive cookies, you may set your browser to reject cookies or to alert you when a cookie is placed on your computer. Although you are not required to accept cookies when you visit a Pass the OT Internet Site, you may be unable to use all of the functionality of the site if your browser rejects our cookies. 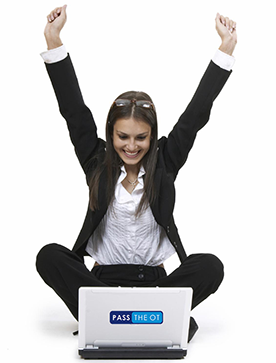 Pass the OT retains all personal information collected on Pass the OT Internet Sites and web forms as long as necessary to provide the services, products, and information you request or as permitted by applicable law. Your personal information will generally be stored in Pass the OT databases or databases maintained by our service providers. Most of these databases are stored on servers located in the United States. To the extent required by law, if your personal information will be transferred outside your country an appropriate notice will be provided. Pass the OT maintains reasonable safeguards to protect the confidentiality, security, and integrity of your personal information. For example, we use secure socket layer (SSL) technology to transfer personal information over the Internet. Although we use security measures to help protect your personal information against unauthorized disclosure, misuse or alteration, as is the case with all computer networks linked to the Internet, we cannot guarantee the security of information provided over the Internet and will not be responsible for breaches of security beyond our reasonable control. If you wish to access, correct, update or request deletion of your personal information, you can do so at any time by contacting us using the contact details provided under the Contact Pass the OT below. In addition, you can object to the processing of your personal information, ask us to restrict processing of your personal information or request portability of your personal information. Again, you can exercise these rights by contacting us using the contact details provided under Contact Pass the OT below. You have the right to opt-out of marketing communications we send you at any time. You can exercise this right by clicking on the “unsubscribe” or “opt-out” link in the marketing emails we send you. Registered users can manage their account settings and email marketing preferences as described in the “Choices Regarding Your Personal Information” section below. If you are an unregistered user, or to opt-out of other forms of marketing (such as postal marketing or telemarketing), you may contact us using the contact details provided under Contact Pass the OT below. Pass the OT reserves the right, at its sole discretion, to change, modify, add or remove any portion of this policy, in whole or in part, at any time. Changes in Policy will be effective when posted. You agree to review this Policy periodically to be aware of any changes. Your continued use of the Site after any changes to this Policy will be considered acceptance of those changes.